Key Difference: A policy is a document that outlines what a government is going to do and what it can achieve for the society as a whole. It also outlines any and all methods and principles that the government or any entity, for that matter, will use to achieve its directive. Legislation is another term meaning statutory law. These laws have been enacted by a legislature or the governing body of a country. Legislation can also mean the process of making the law. Policies and legislations are an important aspect of a society; these ensure that a person know how to act in a society. It also regulates and ensures that everyone follows the rules and law that should be followed. These laws are made to treat every person as equal and so that no person can consider himself above the law based on his social standing. Policies and legislations are similar in nature and because of this they are often confused; however, they have distinct differences. According to the Food and Agriculture Organization of the United Nations, a policy is a "set of decisions which are oriented towards a long-term purpose or to a particular problem." A policy is a document that outlines what a government is going to do and what it can achieve for the society as a whole. It also outlines any and all methods and principles that the government or any entity, for that matter, will use to achieve its directive. Essentially, a policy sets out the goals and planned activities of an entity, whereas a law may be needed to pass to enable government to put in place the necessary institutional and legal frameworks to achieve their aims as set out in the policy. 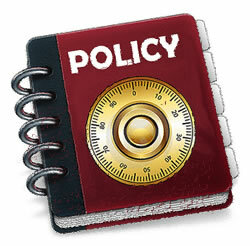 A policy is an informal document that just lists and states what must be done and what is intended to be done in the future. A definite course of action adopted for the sake of expediency, facility, etc. : We have a new company policy. A course of action adopted and pursued by a government, ruler, political party, etc. : our nation's foreign policy. Action or procedure conforming to or considered with reference to prudence or expediency: It was good policy to consent. Sagacity; shrewdness: Showing great policy, he pitted his enemies against one another. Legislation is another term meaning statutory law. These laws have been enacted by a legislature or the governing body of a country. Legislation can also mean the process of making the law. Let’s first understand how a law is made. The law starts off with being an idea. The idea is then put down a piece of paper, which is known as a bill. This bill goes then goes to the legislative branch, who will vote either to approve or reject the bill. If the bill is approved, it then goes to the regulatory branch, which is responsible for writing out the details of the bill and the implementation process. This bill then becomes a law. This process varies depending upon the countries. Under the Westminster system, the primary legislation, after it is approved is known as an Act of Parliament. The term ‘legislation’ may also include other forms of law making such as referendums, constitutional conventions, orders in council or regulations. However, the term primary legislation can exclude these laws. The act of making or enacting laws. A law or a body of laws enacted. Policies are a course of action that the government or an organization plans to take. Policies are just decisions that set the floor for a long-term goal. However, it does not ensure that the policies will be successfully followed or they will successful in helping the organization reach that long-term goal. Now, legislations are actual laws that are enforceable, which means they must happen and should be followed. Legislations also require a voting to ensure that they are passed, while policies can be decided by the government or the head of the organization. It's like the difference between Theory and Practice.